Shanshan Li is a second-year undergraduate student. She said that she’s experiencing double culture shock. The number of very young Chinese students arriving in B.C. is increasing and it’s creating a large new cohort of Chinese teenagers who are experiencing “double culture shock,” say those who have lived it and those studying them. 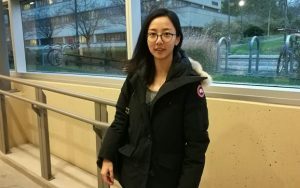 Chinese students who spend their teen years in Canada, a number that quadrupled in the last five years according to a report published in 2016, say they don’t feel like they belong anywhere. “You no longer feel that you belong to your original home, and you don’t quite fit in the Canadian society, because you have only been here for a few years,” explained Gillian Creese, a professor at the University of B.C.’s department of sociology. Creese has studied why this “double culture shock” happens. “When children are old enough, they already have a sense of who they are. Now they arrive here and they are suddenly confronted by very different expectations,” said Creese. Many Chinese students realize that they have double culture shock after living in Vancouver for several years. “After living in Vancouver for more than 10 years, I feel like my identity as a Chinese has changed. I see myself as neither Chinese nor Canadian,” said Clair Ping, a UBC undergraduate student who arrived in Vancouver at the age of 10. Another student who has experienced the same is Shanshan Li. She has been studying in Canada since she was 15 and she says for her and her parents “going home” means something entirely different. For her, going back to Beijing means not only visiting her parents and friends. But it also means living in a city that she is now unfamiliar with. “I miss my parents but I don’t want to go back to China. When I was in China, I felt awkward sometimes because I didn’t know how I should behave,” said Li, 21. While many Chinese students have already booked their airline tickets home for Christmas, Li says she’s hesitating. Compared to many Chinese students, Li is well integrated. 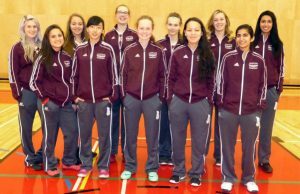 She was a member of the school basketball team in high school and that helped her build relationships with many of her Canadian friends. Shanshan Li, second from the left, said her basketball teammates in her high school helped her integrate. But Li says she still feels like an outsider in Vancouver. What’s worse, she says she also felt confused and frustrated when she went back to China. In 2014, Li had a big argument with her cousin. She can’t remember why this happened. But she remembers clearly what her mother said after they went back home. “She said I had changed a lot in recent years. She remembered that I never had argument with my relatives before I went abroad,” said Li. This was the first time Li noticed that her patterns of behaviour had changed. Once she noticed that she had culture shock in China, she couldn’t ignore it anymore. But the fact that students don’t feel at home in China doesn’t always mean that they feel at home in Vancouver either. Some supports are in place to help Chinese students find accommodation and adjust to the Canadian educational system. British Columbia is the first province to provide homestay guidelines to international students. All international students under 19 are required to live with host families and they can get homestay information from the Vancouver school board. Schools also provide help in course selection and finding volunteering opportunities. However, supports provided by schools to help Chinese students integrate more fully into Canadian society are limited. Student Baixi Zhao, 16, came to Vancouver one year ago. Her father sent her to Vancouver, hoping that she would adjust quickly to North American culture. She transferred to Prince of Wales Secondary School this semester. “In my school, approximately 60 per cent of students are Chinese,” she said. “There is a counsellor who is responsible for the communication with Chinese students in my previous school. I talked to him several times last year, but he didn’t provide any practical advice,” said Zhao. There is no school counsellor in her new school to help with transition. Teenagers and young adults are mostly left on their own to adjust to the implications of living in two cultures.